Houghton Library's collection includes an early edition of the "The Star-Spangled Banner," likely printed sometime between 1816 and 1821 (photo 1). An illustration of the flag that inspired the piece was included in a packet of material printed as souvenirs for collectors (photo 2). Francis Scott Key (photo 3) as pictured in a book at Houghton. During the War of 1812, on the rainy morning of Sept. 13, 1814, British troops launched a land and sea attack on Fort McHenry, a star-shaped U.S. stronghold built to guard Baltimore from naval assault. Despite the relentless cannonade, the fort’s commander, George Armistead, refused to surrender. One American had a front-row seat for that battle, which played out 200 years ago this week. Guarded by British troops, lawyer and amateur poet Francis Scott Key watched from a sloop, the Minden, as bombs rained on Fort McHenry in that memorable battle from the largely forgotten war. But what hasn’t been forgotten is Key’s resultant, iconic poem. Inspired by the American troops who repelled the attack, Key hastily penned four verses on the back of a letter to commemorate the fight and the giant American garrison flag that still flew as dawn broke over the fort on Sept. 14. 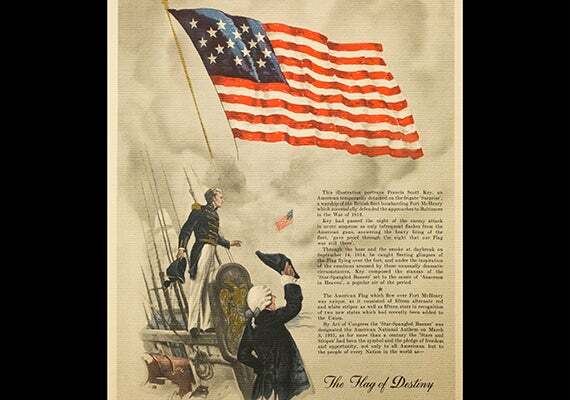 The poem “The Defence of Fort McHenry” would become the American national anthem, “The Star-Spangled Banner.” In advance of its 200th birthday, several Harvard scholars reflected on the song’s legacy, its language, and its lyricism. Key eventually set his ode to music, ironically using the tune from a popular English song. That tune is now part of the nation’s collective soul. But, as many a musician will tell you, it isn’t easy to sing. Anyone who has attended a baseball game, watched the Super Bowl, been to a Fourth of July celebration, or any number of patriotic or sporting events has likely hummed or sung along to what is an enduring symbol of national pride. They’ve also probably dropped out when the going gets tough. The lines “rockets’ red glare,” “bombs bursting in air,” and “land of the free” include the anthem’s highest and hardest notes, and have humbled some of the most accomplished singers. According to one Harvard historian, during much of the 19th and the early part of the 20th centuries, another song had a greater hold on the nation’s patriotic soul. 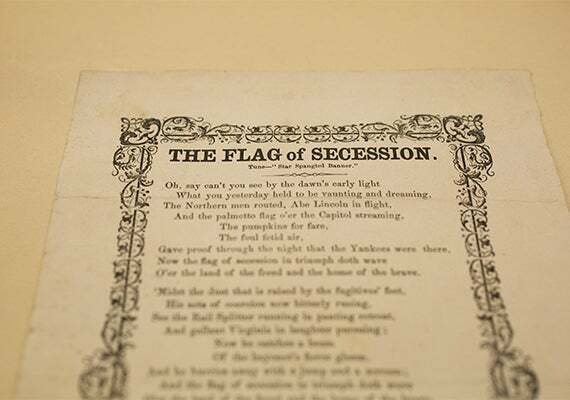 But Stauffer, who referred to “The Battle Hymn” as the nation’s unofficial anthem and praised it for its “immensely lyrical and extraordinary lyrics,” is relieved it has flown below the radar. The obligatory singing of “The Star-Spangled Banner” at any number of events, he argued, has robbed it of much of its and power and meaning. 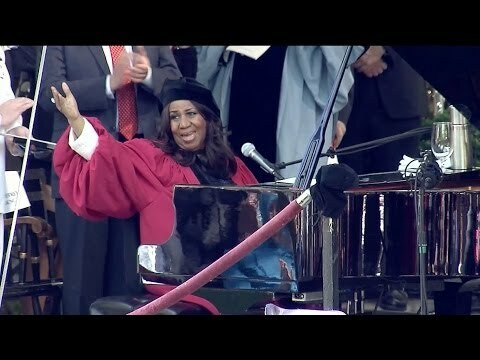 Asked to reflect on the song’s poetry, Elisa New, Harvard’s Powell M. Cabot Professor of American Literature, said she was struck by “how visual it is: ‘Oh, say can you SEE,’ showing us the natural light, then the technological light, then the vivid spectacle of iconic visual symbols, dawn, twilight, rocket, flag. Carr Center Program Director Tim McCarthy (center) kicked off The A.R.T. of Human Rights with a discussion with activist John "Long Jones" Wambere (from left), Malika Zouhali-Worrall, and "Witness Uganda" co-creators Griffin Matthews, and Matt Gould (photo 1). Wambere and Zouhali-Worrall discussed their documentary "Call Me Kuchu" (photo 2), and Matthews and Gould performed some songs from their hit musical.